While most don’t realize it, golf can be very taxing on the body. With long hours on the course, lots of walking, and precise movements, golfers need to make sure that their body is in prime condition to succeed. Like many other sports, preparing the body to play occurs off the course with flexibility exercises. Increased flexibility can do wonders for your performance on the green. When they’re not playing, many professional golfers do regular exercises that target specific muscle groups. By doing so, they are improving their flexibility. This ultimately helps to achieve more power and accuracy during a swing. Flexibility exercises can improve various aspects of your body that play a part in making a successful swing. By performing these exercises on a regular basis, you can see improvements in your power, stability, aim, and more. This stretch is designed to work your hip, shoulder, and spine all in one go. The compound stretch should be done before you hit the course. It can lengthen the soft tissue and give your upper body more flexibility in the back swing and follow up. Start off by lying on your side on a comfortable surface, such as your bed. Then, raise your top leg up to your waist. At the same time, rotate your top arm and torso to the opposite direction. Hold onto this position for 30 seconds before switching sides. Performing a back stretch is great for strengthening your back muscles and improving your posture. It’s a static exercise, so you shouldn’t do it before a game. Instead, incorporate it into your normal workout routine to see results over time. To perform the stretch, get down onto your knees and extend both arms in front of you. Slowly slide your arms away from you. As you do this, move your hips back. You’ll reach a point where the back becomes stretched and slightly uncomfortable. When that occurs, hold it there. After holding for some time, move your hands to the left or right to stretch the side of your torso. This hamstring stretch is very popular with many athletes. It’s a versatile stretch that’s easy to incorporate into your normal routine. It can help to strengthen your hamstrings, which can improve your stability as you swing. Sit down in the upright position and tuck one leg into your body. The other leg should be extended out. This will be the hamstring that you stretch first. Bend forward with your hips and reach down towards your foot until you feel the stretch. Hold it there before you switch to the other side. Make sure to keep your back straight as you stretch. This is a dynamic stretch that imitates the motions of your body as you swing. It strengthens a number of different areas, including your hamstrings and spine. When done regularly, it can improve your spinal posture and flexibility. Start off by placing your feet in the same position you would if you were about to swing. Then, fold your arms in and bend down at the hips. Your back should be straight and your knees should be bent slightly. To perform the exercise, simply rotate your shoulders to the left and right. Your head should remain stationary and your spin should be stable. The shoulder and chest stretch should be performed on a regular basis off the course. It’s designed to improve the range of motion in your shoulders. Additionally, it strengthens the chest to improve your posture. Start the exercise by extending your arms behind you in a straight line. They should be raised as far back as you can get them comfortably. This exercise can be done standing up or kneeling down, whichever is preferred. Once the arms are extended, bend forward at the hips, bringing the hands up further behind you. Simply hold this pose and repeat. This is a unique exercise that works out multiple muscles in your leg, hip, shoulder, and spine. It can improve flexibility in your hips and help you overcome any restrictions you are facing. Place a stable chair in front of you and place one foot on the edge of the chair. The other foot should be firmly on the ground behind you. Extend both arms toward the chair and dip into your foot. Repeat this 10 times before switching feet. If you want to make it a bigger challenge, raise your arm up at a 90-degree angle. This arm should be on the same side as your foot that’s on the chair. Now, with every dip into the chair you do, move your torso to the opposite side of your raised arm. Use the arm to bend at the hip. Designed to stretch your shoulders, head, and spine, this exercise can help you improve the motions of your swing. It will let you achieve a fuller swing with more control. The stretch is easy to do and can be done on any door. Simply start by standing next to an object on the wall like a door jamb. 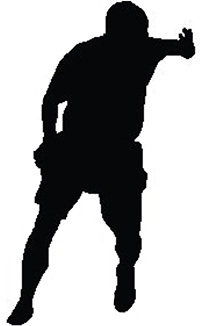 Grab this object with the hand that’s furthest away so that you can achieve a backhand grip. Now, rotate your head and body away from your hand and hold it once you feel tension. Many guys experience a number of limitation that can affect their swing. These limitations, while minor at first, will begin to make themselves known as you get older. Some of the most common issues men face deal with hip mobility, leg stability, and poor spine rotation. All of these issues have a direct impact on your swing. For example, hip mobility and spine rotation can affect the overall power of your swing and the arc your achieve while stability can affect your accuracy. To overcome these problems, golfers need to figure out where their problem areas are and perform exercises to strengthen their body over time. A golf swing analyzer is a great tool breaking down your swing. You can view every parameter of a swing to get a better understanding of where you need to improve. With this information, you can target specific areas of the body to train. Stretching is an easy way to overcome issues and strengthen targeted areas of the body. These improvements are minor compared to rigorous strength training. However, the improvements you make can collectively improve your swing. Muscle imbalances affect your overall posture and movement. Imbalances refer to both weakened muscles and overactive ones. If some muscles used to swing are stronger than others, it can create a unique problem that prevents you from reaching your full potential. Stretching can help to even out muscle strength. One great example of an imbalance is a weak back combined with a strong chest. 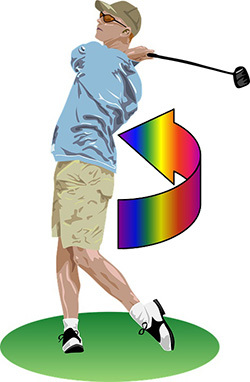 This combination results in poor posture, which decreases your ability to rotate your body and take a powerful swing. Lengthening soft tissue throughout your body will provide you with more range of motion. Muscles that go unstretched will become tight and inflexible. By pushing that muscle to its limits, you’re forcing it to stretch out and get longer. As a result, you can move farther and achieve better results. This is especially useful when it comes to your golf swing. More tissue length allows you to reach farther back in your upswing, which can lead to more power. A full program can help you reduce your chances of injury. Guys that don’t stretch or perform targeted flexibility exercises are more prone to injury than those that do. This is why amateur golfers are injured more than professionals. Common injuries like lower back pain, hip issues, and rotator cuff tendonitis can be avoided with regular exercise. These injuries often occur because golfers are trying to improve their swing without understanding the cause of their issues. They may read information on their swing analyzer and try to improve aspects immediately rather than slowly over time. This is especially common on golfers that are trying to get more power by simply swinging harder and faster. If you want to get better at your swing, you need to perform these flexibility exercises. They specifically target the many muscles that you use during your swing. Not only that, but they will help to improve your overall health and range of motion.